Gangfight Games is one of the many companies out at Origins this weekend. But you don't have to be right at the show in order to see some of the cool things they're working on. No, they've shown off some new preview artwork that I'm more than happy to share with you here. So, what all do we have here? 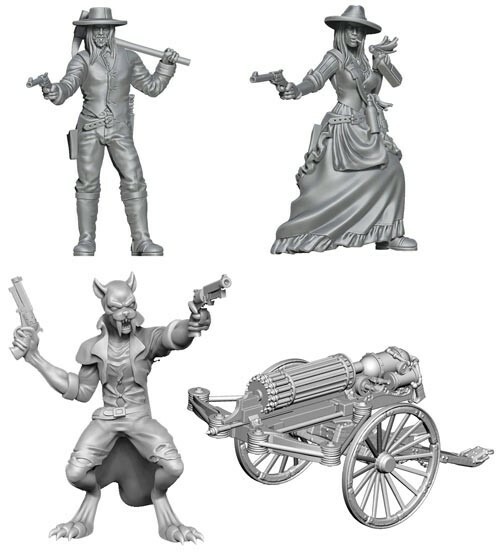 In the first photo, across the top are Colin Buchanan and Janey Bower, a pair of monster hunters in the Unsung gang. Beneath that is Wampus, the leader of the Wormwood Wardens, a new Beast gang. Then there's the Heavy Bolter (ROF 3, STR 5, AP 4+ ... ok, not really). 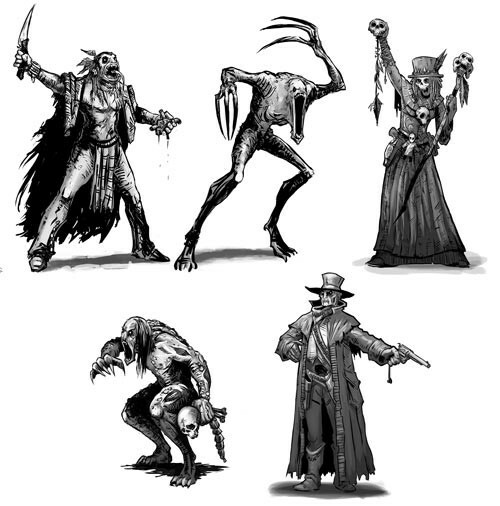 The second photo is concept art for the Wicked, a new Undead gang. Going left to right (and then top to bottom, of course) there's the Wendigo, Rake, Brujah, Ghoul, and Revenant.